At this point, you probably don't need some scientific study to tell you that grabbing a couple of beers after a long day does wonders for your mental health. But as it turns out, exciting new research suggests there's a significant benefit to enjoying a few drinks on the regular; specifically, moderate drinking can be good for your heart. In two recent studies, researchers at The Norwegian University of Science and Technology and the Karolinska Institute in Stockholm looked at how alcohol affects heart health, and found that people who regularly drink in moderation were found to have better cardiovascular health than people who consume little or no alcohol, according to Science Daily. In particular, the studies suggest that people who had three to five drinks every week were at a 33% lower risk of heart failure than those who didn't drink as much, and that it even reduced the risk of heart attacks. Imre Janszky, a professor of social medicine at NTNU, told Science Daily various types of booze -- beer, wine, or hard liquor -- resulted in the same benefits. "It's primarily the alcohol that leads to more good cholesterol, among other things," Janszky said, per the report. "But alcohol can also cause higher blood pressure. So it's best to drink moderate amounts relatively often." 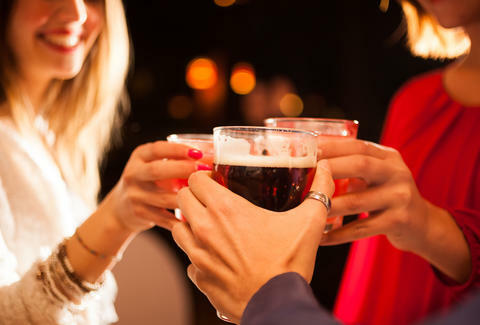 While the research is certainly great news for people who enjoy a few beverages every week, it's by no means reason to go wild and drink irresponsibly. With that said, Janszky warns that drinking alcohol can result in other problems and isn't the only way to way to keep your heart healthy. Additionally, few of the tens of thousands of subjects included in the studies were noted as heavy drinkers, so the researchers stressed that it's unclear if drinking too much does anything to reduce the risk of heart attack or heart failure, and that having five or more per week has been associated with an increased risk of cardiovascular disease, liver disease, and other health problems. "I'm not encouraging people to drink alcohol all the time," Janszky said. "We've only been studying the heart, and it's important to emphasize that a little alcohol every day can be healthy for the heart. But that doesn't mean it's necessary to drink alcohol every day to have a healthy heart." Obviously, these aren't the first studies to suggest benefits from moderate drinking, considering recent claims that drinking can improve aging and even how attractive you're perceived by others. But as always, guys, drink responsibly. Tony Merevick is Cities News Editor at Thrillist and always enjoys alcohol-related science. Send news tips to news@thrillist.com and follow him on Twitter @tonymerevick.